Look out of almost any urban window for more than two minutes and you will probably see a Ford Transit. The van is so enormously popular in Europe that the brand name, much like the Hoover for vacuum cleaning, has become a synonym for light commercial vehicles in general. In 2013, Ford split its range of Transits into the smaller one-tonne Custom and the larger model featured here, all of which bring a host of features to represent a marked improvement on previous models. If your business has serious space and haulage needs the Transit is a premium, heavy-duty option that should provide more than ample storage and power for the vast majority of small firms. When you go up to this weight class, your customisation options open up, and the new Transit is available in more than 450 different combinations – meaning you should be able to find a model that fits whatever your business needs are. For starters, the load space goes from 9.6 cubic metres on the basic model to a huge 15.1 cubic metres on the ‘Jumbo’ model, although this is still slightly less than the 17 cubic metres offered by rivals such as the Mercedes-Benz Sprinter and Iveco Daily. The van is powered by a 2.2litre TDCi diesel engine, which comes with a choice of three outputs: 100PS, 125PS and 150PS, all linked to a six-speed transmission as standard. The highest-horsepower engine should provide you with enough power if you regularly carry close to the vehicle’s payload limit, but the least powerful engine has been reported to struggle even with moderate loads. If you regularly carry heavy loads, which is likely if you’re looking into a van of this size, a more powerful engine will probably justify the extra outlay. Whilst heavy-duty vans like the Transit will never be as economical as smaller vans, the Transit’s ECOnetic option delivers more than respectable fuel economy, averaging a stated 44.1mpg. The standard versions have improved MPG as well, with a 6% improvement on the previous generation – the largest long-wheelbase Jumbo model with 153HP engine delivers around 36mpg. Ford has worked hard on improving the handling of its Transit range, and the new model delivers exceptional manoeuvrability for a van of this size; the steering is intuitive and extremely responsive, even with a fully-loaded van. “This is truly the van of the moment,” says BusinessVans.co.uk’s Ralph Morton of the Transit. “It’s the first time Ford has really had a van that can compete properly in the 2 tonne segment – and how! 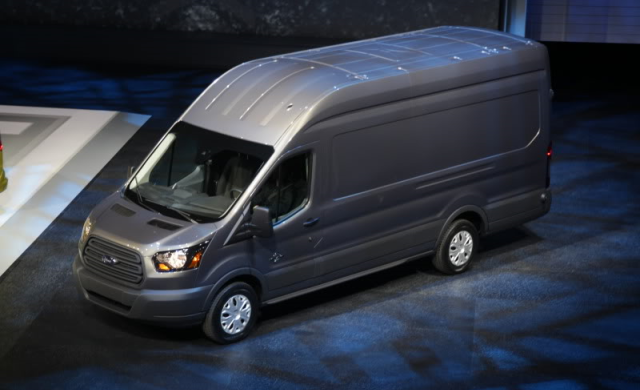 There’s a huge variety of load areas, body lengths – in fact Ford promises 450 different Transit variants. This is Ford’s first foray into the heavy vans market, and other manufacturers have a well-established presence in the sector. If you’re after something less state-of-the-art, the Mercedes Sprinter continues to be a popular and well-reviewed van, which the Transit has now matched in build quality, reliability and comfort. One thing to note is if you need all the load space you can get, other vans such as the Renault Master offer slightly more maximum capacity than the new Transit – the Master offers 17.2 cu metres load space compared to the maximum 15.1 offered by Ford’s model.